For as long as I can remember, I have known about Henrietta (Brimlow) Frith (1847-1884) and her sad death at the age of 37. My mother told me the tale her grandmother Nettie Frith (1875-1963) had told her about her mother Henrietta dying and seeing her in the casket with her stillborn child in her arms. It was not difficult to trace Henrietta to her parents, George Brimlow and Elizabeth Weeks. It was also not difficult to work out George’s parents and siblings thanks to the early research provided by my distant cousin Chris Beale. Chris had done quite a bit of the legwork prior to the explosion of records online. It was Chris who outlined the basic family, located the family plot at Cypress Hills Cemetery, and located the passenger list. With Chris’s excellent research as a starting point, I went through thirty years of New York City and Brooklyn directories, combed the NY State Census records, and drove myself insane looking at New York and Brooklyn birth, death, and marriage records to fill in the gaps and add some flesh to the bones. Let’s address the two concerns with this record – the name and the occupation. As stated in the previous post, a genealogist has to be flexible with the name. The family is English and if they are from Northwesterern England, Shropshire/Cheshire/Lancashire, which all border on Wales, the pronunciation of the name will sound more like Broom or Brom than it does Brim. As for the occupation… occupations are usually the job people last held and not necessarily what they may have done earlier in life or will be doing in the future. As proven in the previous post about William Brown, he listed himself as a farmer, but he was actually a butcher. And William Brimlow’s oldest son George named himself as a coffee roaster on the census and a clerk in the directory of the same year before changing his occupation to engineer only one year later. This is America—you can be whatever you choose. The Brimlows are well established in New York’s Lower East Side. On 7 Nov 1842, William is naturalized.4 In 1846, the business address changes to 16 James Slip, where it will remain for at least the next 10 years. William and Ann appear with youngest son John on the 1850 Federal Census in New York Ward 4.5 The family has moved to 59 Monroe Street and middle son William appears in the city directory at that address with his father and brother George as a clerk for the first time in 1851. About 1852, William married Deborah (Gedney) Woodhall (1817-16 Nov 1895),7 17 years his junior, she was the widow of Thomas Woodhall (1818-1850). She had three children from her previous marriage: Mary Elizabeth (Woodhall) Wines Jones; Josephine (Woodhall) Johnson, and Leander Byron Woodhall. Some of these children were enumerated as Brimlow at times. William and Deborah had three children together: Arthur W., Frederick Austin, and Ella Helen. The next post will be about William and Ann in England, and the evidence related to Ann’s maiden name in the Wood versus Chaddock debate. 1. “New York, Passenger Lists, 1820-1957, Ancestry,” online images(accessed 20 May 2014), manifest, Ajax, 29 Nov 1832, William Broomelaw and family. Cit. Date: 20 May 2014. 3. 1840 U.S. census, New York Ward 4, New York, New York, p. 219, line 20, Wm Brimlow; digital images, Ancestry (accessed 30 Nov 2015); citing National Archives and Records Administration microfilm M704, roll 300. Cit. Date: 30 Nov 2015. 4. Rec# 33, 7 Nov 1842, William Brimlow, English, Marine Court of New York City; digital images(accessed 20 May 2014). Cit. Date: 20 May 2014. 5. 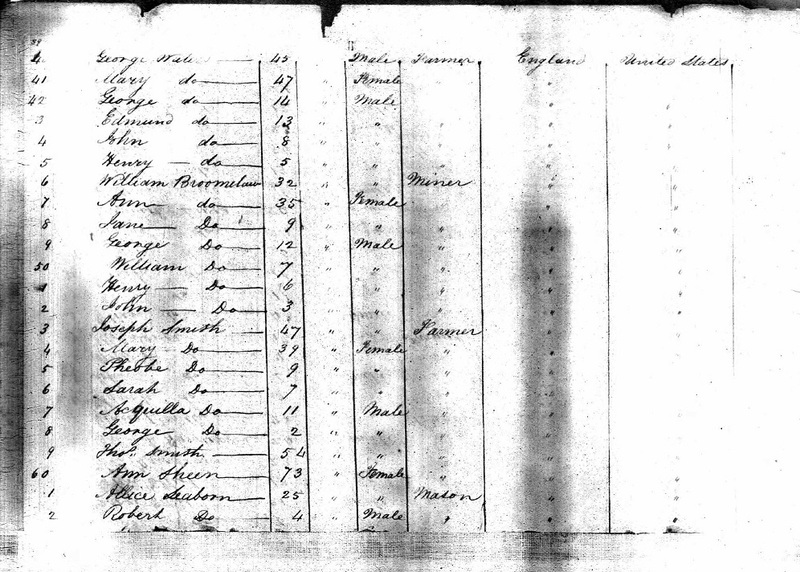 1850 U.S. census, population schedule, New York, New York, p. 278A, dwelling 461, family 1694, William Brimlee; digital images, Ancestry (accessed 14 May 2014); citing National Archives and Records Administration microfilm M432, roll M432 536. Cit. Date: 14 May 2014. 6. Interment Records, Cypress Hills Cemetery interment #1254 – Ann Brimlow, 13 Mar 1851, Sec 2, Lot 168. 7. New York death certificate #19974, Deborah Brimlow, died 16 Nov 1895, 249 Broadway, 2nd floor, Williamsburg, Brooklyn, Kings, age 70 (or 76)y 6 mo., apoplexy, buried 19 Nov 1895. Cit. Date: 15 May 2014. 8. 1865 NewYork State Census, Brooklyn Ward 13, Kings, New York, p. 21, dwelling 88, family 152, line 29, Wm Brimlow 65, Deborah Brimlow 49, Leander W. Brimlow 18, Mary Wines 25, Arthur Brimlow 12, Fredk Brimlow 10, Ella Brimlow 8; digital images(accessed 30 Nov 2015). Cit. Date: 30 Nov 2015. 9. 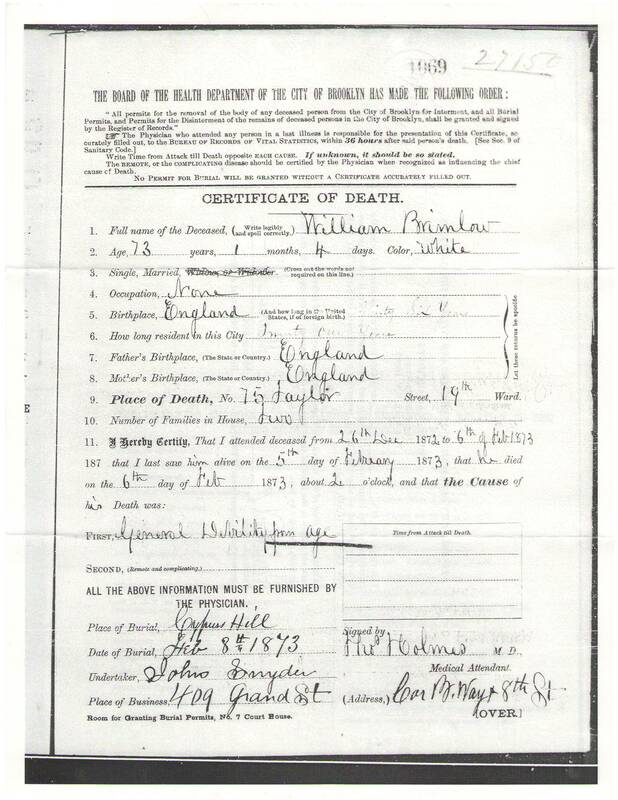 “New York Death Records,” database(accessed 27 Nov 2015), Certificate #1069, William Brimlow died 6 Feb 1873, age 73, Brooklyn, Kings, buried 8 Feb 1873 Cypress Hills Cemetery. 10. Interment Records, Cypress Hills Cemetery, William Brimlow was interred 8 Feb 1873, in Sec 2, Lot 168. 11. New York death certificate #19974, Deborah Brimlow, died 16 Nov 1895, 249 Broadway, 2nd floor, Williamsburg, Brooklyn, Kings, age 70 (or 76)y 6 mo., apoplexy, buried 19 Nov 1895. Cit. Date: 15 May 2014.